I have been fortunate to have had many healing sessions with Deirdre over the last 6 years. Deirdre is a naturally gifted and intuitive healer and uses all her skills and knowledge of Reiki, Seichem, Crystal and Angelic healing during each session, so that each client receives the healing they need at that time. With Deirdre’s assistance I have received many personal insights that have helped me in all aspects of my life and also to move forward on my life path. Every session with Deirdre is extremely enjoyable and beneficial and I would highly recommend seeing her for healing sessions as she is a truly gifted healer and a wonderful person. I did an angel course with Deirdre in March 2012 at a very stressful time in my life. It was a wonderful opportunity to meet up with a lovely group of people and to learn so many new things about Angels. Deirdre was an excellent and natural facilitator who introduced us to the world of angels, allowing us to connect with our own angel to the point of learning our angel’s name. I, personally, learnt to focus on what I wanted to achieve in my own life. It was with Deirdre’s help that I found the motivation I needed to make some lifestyle changes. I am now in a much happier place today as a result of the time spent on this truly inspiring angel course. Love and best wishes as always to you dear Deirdre. My 8 year old son Jack attended several semesters with Deirdre in her children’s meditation classes in Ashbourne. I enrolled Jack in the meditation classes as he has a long term illness and sometimes he found the build up to and the actual hospital visits to be very stressful. He had always been a little anxious and tended to worry but his diagnosis with Type 1 diabetes saw this anxiety level heighten. Since attending Deirdre’s classes I have seen a dramatic difference. While Jack is aware that we can do little to change the requirement for hospital visits his anxiety levels in the lead up has dramatically decreased. His levels of confidence have grown and I can see him become braver and more certain in his choices. He frequently spoke about the mantras and it was a joy to see the change in him. I believe that Deirdre teaches the children much needed skills for them to not only cope but flourish in the fast paced society we all live in. 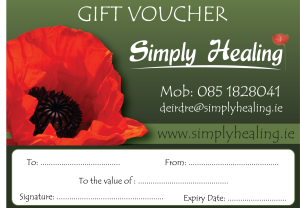 I have known Deirdre McCormack for several years now and would regularly book healing sessions with Deirdre. She has an amazing ability that allows her to channel really beautiful healing energy and I always feel revitalised and well after having been for a healing session. I find for me personally Deirdre has a natural way of moving stress and its affects from my body and mind. I have also attended Deirdre’s classes and work shops. Deirdre is a natural teacher, who is very compassionate and knowledgeable in all that she does. She is very intuitive and will offer feed back in a loving and kind manner. I feel blessed to have come across Deirdre and would highly recommend her. I go to Deirdre for both Reiki and Angelic Healing and find her treatments fantastic for me. Living a fairly hectic lifestyle I find I totally relax and feel completely rejuvenated after a session with her. We all have some stress in our lives and I would certainly recommend a visit to Deirdre to help de-stress, relax and live our lives to the full.